I am excited to share that I’ve been nominated for the Liebster Blog Award by Amber’s Supernatural and YA Book Reviews. Aside from her name being AWESOME, I’d like to thank Amber for the nomination!!! The Liebster Blog Award is given to upcoming bloggers who have less than 200 followers and Liebster is a German word which means sweetest, kindest, nicest, dearest, beloved, lovely, kind, pleasant, valued, cute, endearing and welcome. How great is that? There is a part of me that still wants to be a medical examiner…but I think I’m done with school. I absolutely HATE to fly. 2. Do you buy a book based on its cover? Not really, I usually look at the reviews. 3. How many books have you read this year? I think 23-25 so far. Witch Way to Turn by Karen Y. Bynum for a blog tour. 6. If there was anything you could change on your blog, what would it be and why? Better buttons…I can’t figure out how to get them to line up! 7. Is blogging a hobby or a career move? A career move at first, but I like doing more with it! 8. What was your favorite story to read as a child? 9. Is reading something you’ve recently picked up or has it always been with you? I’ve always been a reader, and now I have to read everyday or I feel off. 10. If you could be any character from any book, who would you be and why? I like Cassandra, the vampire from Kelley Armstrong’s Otherworld series. I would want to be immortal to live through history, and why not pick a female! 11. 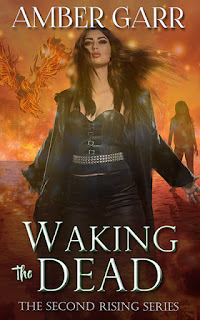 Are you a follower of Amber’s Supernatural and YA Reviews? I am now! Thanks again for the nomination and introduction to your blog!!! 1. If you could have dinner with any character, who would it be? 2. Why did you start to blog? 4. Do you have a favorite spot to read? 6. Do you post reviews of books? 7. How many books are in your TBR pile? 8. If you could have any superpower, what would it be and why? 10. How many hours a week do you read? 11. Do you write? What type of genre? Love it!! I think you're the first to follow through with this!! Yeah! Now I just have to let everyone else know! !